The church is left open most days so you are free to visit when you wish. This prayer guide is available in the church but if you are unable to visit, then this virtual prayer tour will help you to appreciate our building and its features. CLICK HERE FOR THE PRAYER TOUR OF HOLY CROSS. The Church is dedicated in honour of the Cross of Christ. All Christians are called by their baptism to follow the crucified Christ. There are many ways of doing this. Here at Holy Cross we try to hold to the Catholic understanding of the faith as received by the Church of England. For this reason there are many aids to our worship. Some of these you will see about you as you visit the church. The Parish is a daughter church of the Holy Trinity on Dean Street. 2007 was our centenary year as in 1907 a temporary corrugated-iron church was built on St. Annes Road and given the title of the Holy Cross. On Advent Sunday 1930 the present church and hall were opened. In 1962 alterations to the church meat that it could be consecrated as a Parish Church and this took place in 1965. 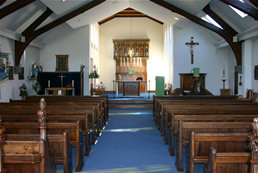 In 1995, after a fire, the Presbyterium (that part of the church in which the altar stands) was re-ordered and in 2007 further alterations, including a new porch, and renovations were carried out. In terms of Christian history this is a “new” church. But we rejoice that our faith is built on that of the people who went before us. Almighty God, we praise you for all your servants who have finished their course in your faith and fear; for those known to us and unknown. We pray that encouraged by their example and strengthened by their fellowship we too may be found worthy to be partakers of the inheritance of the saints in glory: through Jesus Christ Our Lord.